​Here’s a one-pan dinner roast that makes healthy eating simple and delicious. Fitness dinners simply don’t get easier to prepare than this. Feel free to use whatever vegetables you have on hand that are seasonal and fresh. Place a rimmed baking sheet into the oven and preheat to 425 degrees F.
Combine the thyme, Dijon and syrup in a small bowl; brush over the chicken. Remove the pan from the oven, place the chicken on the pan and bake for 20 minutes. 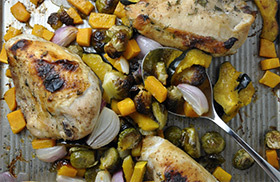 Add the squashes and Brussels sprouts to the pan with the chicken. Top the veggies with the coconut oil, olive oil, ¾ teaspoon sea salt and ¼ teaspoon black pepper. Return to the oven for another 20 minutes. Serve immediately.